For 2010 remake, see Aliens vs. Predator (2010). Classic 2000 edition includes the added content from the Gold Edition, as well as modifications to run the game on modern systems without requiring tweaking. Only the GOG.com and Steam versions of Classic 2000 include multiplayer. Patches are available for both the Windows and Macintosh versions. Digital distribution versions are already patched. 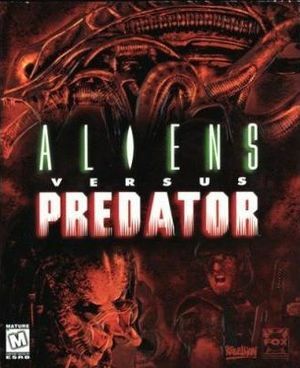 Aliens versus Predator Classic Redux - a completed project that updates and expands the original Aliens vs. Predator Classic 2000. It replaces almost every model, texture, and sound in the game with higher quality ones. Every single-player and standard multiplayer map has these improvements, and some single-player levels have significant additions. Unofficial OS X and Linux ports were created and their source code is available here. It contains compiling instructions and required dependencies for compiling. Added in Version 1.01 update for Classic 2000. 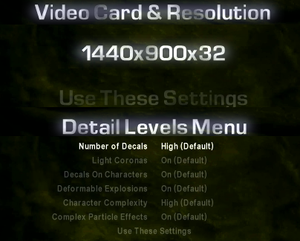 Cutscenes and main menu are 640x480. Use Widescreen Fixer to center the HUD. Text scales very poorly at higher resolutions. There is negative mouse acceleration. Also, the more FPS the game runs on, the higher sensitivity is. There is a slider for each axis. However, when these sliders are on equal notches, horizontal sensitivity is higher than vertical sensitivity. Downward movement, and movement to the right both have a small dead-zone, and sensitivity for these directions is slightly lower than for the opposite directions. Classic 2000 edition supports XInput controllers. Launcher requires mouse. Full support in-game. Losing focus often causes a sound loop bug. Retail only; removed from digital distribution versions. In some missions game crashes, when player presses any key at the results screen. Play through a level like you normally would. At the end of a level, when the game displays stats press Esc to restart the mission. Press Esc again to go to in-game menu and choose Abort Play to go back to main menu. Choose Single Player and after that choose a campaign, they you've just been playing. Choose a newly unlocked mission from the list and continue your playthrough. By default, the number of saves per level is limited to 8, 4, or 2 (from the easiest to the hardest difficulty). Use the -unlimitedsaves command line argument. By default, saving and loading can only be done via the menus. Open CONFIG.CFG with a text editor (or create it if it does not already exist). Add the following commands to the file. When in-game, press F5 to save and F9 to load. Quick saving and loading always uses the first save slot. Useful when playing as the Alien. When in-game, press C to enable the toggle and X to disable. ↑ 1.0 1.1 File/folder structure within this directory reflects the path(s) listed for Windows and/or Steam game data (use Wine regedit to access Windows registry paths). Games with Steam Cloud support may store data in ~/.steam/steam/userdata/<user-id>/3730/ in addition to or instead of this directory. The app ID (3730) may differ in some cases. Treat backslashes as forward slashes. See the glossary page for details.